Swingin' In Poughkeepsie! is our newest recording and features all of our current members on a variety of romantic standards and swinging favorites. And The Angels Swing! Live! contains a wide selection of up-tempo classics as well as beautiful ballads. Live and Swingin'! is full of great up-tempo tunes for swing dancing all night long! The Big Band Sound's newest recording is chock full of twenty-four of the best of the best big band classic songs and jazz standards. Your top favorites of Glenn Miller's "In The Mood" and "Moonlight Serenade" as well as Benny Goodman's "Sing, Sing, Sing" are all included, in addition to some of our favorite tunes to play that you may not be as familiar with. In tribute to our locality, there's Frank Sinatra's famous "New York, New York" and also Tommy Dorsey's "He's A Gypsy From Poughkeepsie", which is a hidden gem that we uncovered and had our staff arranger, Steve Kessler, cook up an original chart for us. Each of the members of The Big Band Sound gets to shine on Swingin' In Poughkeepsie, from Gary Bank's rendition of Doc Severinsen's trumpet masterpiece "Doc's Holiday" to Dave Cole's recreation of Benny Goodman's theme song "Let's Dance". And, all of the famous big bands of the swing era are represented, including Harry James' romantic "I Don't Want To Walk Without You", Duke Ellington's classic "Don't Get Around Much Anymore", Count Basie's barn-burner "Magic Flea", Stan Kenton's jazzy "A Foggy Day" plus many more. The greatest composers of the era are also covered, from Cole Porter's "Too Darn Hot" to George Gershwin's "Someone To Watch Over Me". Swingin' In Poughkeepsie! 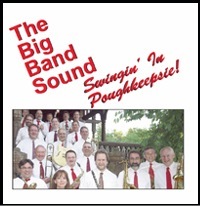 can be purchased at any of our concerts or dances, or you can purchase it online by visiting PayPal.com and directing your $15.00 payment for each CD (shipping and handling included) to dave@thebigbandsound.com. Or, send an email to dave@thebigbandsound.com if you'd like to pay by check or money order. AND THE ANGELS SWING! LIVE! The selections included on And The Angels Swing! Live! perfectly reflect an evening out listening to The Big Band Sound in-person: classic tunes from all the famous big bands, including furious flag-wavers, romantic balladsand everything in-between! This was recorded live at a "1940s Swing Dance" and it's sure to sweep you up in the emotions of the evening! On And The Angels Swing! Live!, The Big Band Sound brings you wonderful big band jazz from the great orchestras of Benny Goodman, Duke Ellington, Tommy Dorsey, Glenn Miller, Artie Shaw, Harry James, Count Basie, and Randy Brooks, along with classic vocals with big band backing from Bobby Darin, Frank Sinatra and Harry Connick Jr., as well as several other choice standards. 24 songs and over 73 minutes of music! And The Angels Swing! Live! can be purchased at any of our concerts or dances, or you can purchase it online by visiting PayPal.com and directing your $15.00 payment for each CD (shipping and handling included) to dave@thebigbandsound.com. Or, send an email to dave@thebigbandsound.com if you'd like to pay by check or money order. The selections offered by The Big Band Sound on Live and Swingin'! 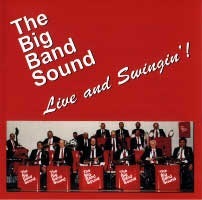 prove that nothing gets people swinging better than the sounds of the classic big bands! This was recorded live at a packed-house swing dance and you can just feel the members of The Big Band Sound feeding off of the incredible energy of the hundreds of dancers! 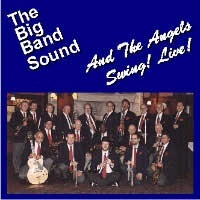 The Big Band Sound lives up to our name on Live and Swingin'! by including the best of the great orchestras of Count Basie, Tommy Dorsey, Duke Ellington, Doc Severinson, Louis Prima, Les Brown, Johnny Long, Benny Goodman, Glenn Miller, Harry James and Stan Kenton. Also included are several of Frank Sinatra's classic songs with big band backing, a touch of the Andrews Sisters, and a couple of more contemporary compositions that followin the brassy big band tradition. 22 songs and over 73 minutes of music! Live And Swingin'! is sold out! These CDs have been featured on the air locally on the Joe Daily In The Morning radio show as well as on the Good Morning Hudson Valley radio show. Our CDs have also been featured on the Swingin' Down The Lane, "Somewhere In Time" and "One Night Stand" nationally syndicated radio shows. And tracks from these CDs were used as background music for Dutchess Community College's production of "The Merchant Of Venice". And that's not all! Our songs are such swinging tunes that they were chosen for the soundtracks of the documentary films "Hudson Valley Honor Flight: Generations Bridge" by The Hudson Cove Group and "Purple Mountain Majesty" by Big Schuss Productions.